This view strikes many as one of blind optimism, rather than a viewpoint based on sober analysis. Nevertheless, trends in recent decades have given it a degree of credibility. There is considerable poverty and hunger in the world, but they have declined significantly in recent decades, even as world population has risen sharply. But does this prove that population can never exceed our ability to provide for ourselves? Surely we can imagine a situation where it would – say, for example, a world so overcrowded where people could scarcely turn around without bumping into each other. Of course there would be catastrophe of starvation long before we would reach such a theoretical state. But at what point, in terms of population, do we start to cross into that danger zone? In 1970, world population was 3.7 billion. Since then it has grown to 7.3 billion. So in the same time frame, the human population doubled, while the fish population declined by half. Is there a correlation. Yes indeed, and it’s one very difficult to deny. 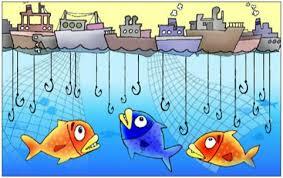 The reason is overfishing brought about by methods of industrial fishing such as bottom trawling. Some governments view the oceans as a “commons” to exploit, and they heavily subsidize their countries’ fishing fleets. Large areas of the sea around Europe are significantly devoid of fish, which has prompted fleets from European countries to search elsewhere for their catches, such as the waters off West Africa. This, however, places them in direct competition with people in poor countries who rely on fishing for their sustenance, and who commonly lack state-of-the art fishing vessels and equipment. Approximately 400 million people in Africa and Southeast Asia rely on fish to meet their need for protein, but catches in these and other tropical areas are likely to decline by 40 percent within the next 35 years. Cornucopians no doubt will tell us not to worry because human ingenuity will come to the rescue. Certainly they will point out the great advances in fish farming in recent decades. At present more than half the fish we consume comes from coastal area and in-land aquaculture. Yet cornucopians often fail to consider that technological solutions often create about as many problems as they solve. Aquaculture indeed has a number of downsides. One is that it is highly polluting, and in coastal waters this will further diminish the stocks of wild fish. Another big problem is that aquaculture commonly uses large quantities of small wild fish to feed the larger ones being raised. That is causing depletion of those small fish. When their numbers crash, what will the feed be then? Also, aquaculture is a breeding ground for infections and parasites which can spread to wild stocks. Certainly there is much we can do to protect the oceans as a food source. Agreements among fishing countries could do much to promote conservation, and even allow for a rebound of fish populations. And aquaculture, despite its problems, will continue to play a role. Still, progress will be difficult, if not impossible, as long as the relentless growth of world population continues unabated and creates an ever-rising demand for food. The current projection is that it will increase from today’s 7.3 billion to 9.6 billion by 2050 (that’s only 35 years). And by the end of the century, the projection is 10.9 billion. Possibly, it could go even higher than that, perhaps to 12 billion. Most of the growth is expected to occur in Sub-Saharan Africa and parts of the Middle East. But this explosion of population doesn’t have to happen. Voluntary family planning has significantly reduced growth in many parts of the world. Prudent action is in order. Even as recently as the mid-20th century, when the world’s total population was 2.5 billion, few imagined that the seemingly inexhaustible bounty of our vast oceans could ever be seriously threatened by human activity. Now what are our prospects as we set to add nearly 2.5 billion more people in just 35 years? The cornucopians will keep saying not to worry, but the startling decline of world fisheries should give even them some cause for pause and to reflect on the reality of limits.